↑ "PepsiCo, Inc. (NYSE:PEP) : Second Quarter 2010 Earnings Preview". IStock Analyst. 15 July 2010. http://www.istockanalyst.com/article/viewarticle/articleid/4311403। আহৰণ কৰা হৈছে: 11 December 2010. ↑ Sellers, Patricia (2012-10-02). "Forbes Magazine's List of The World's 100 Most Powerful Women". Forbes. http://www.forbes.com/wealth/power-women. ↑ Sellers, Patricia (2006-10-02). "It's good to be the boss". CNN. http://money.cnn.com/2006/09/29/magazines/fortune/mpw.femaleCEOs.intro.fortune/index.htm. ↑ "Alumni Leaders — Indra Nooyi '80". Yale School of Management. http://mba.yale.edu/alumni/alumni_leaders/nooyii.shtml। আহৰণ কৰা হৈছে: 2009-07-09. ↑ Levine, Greg (2006-08-14). "'Power Women' Member Nooyi To Lead 'Platinum' Pepsi". Forbes. http://www.forbes.com/2006/08/14/pepsi-nooyi-ceo-cx_gl_0814autofacescan10.html। আহৰণ কৰা হৈছে: 2007-09-10. ↑ "Indra Nooyi, Chairman and CEO of PepsiCo, Named CEO of the Year by GSCLG". Marketwire. 2009-09-09. http://www.marketwire.com/press-release/Global-Supply-Chain-Leaders-Group-Gsclg-NYSE-PEP-1014870.html। আহৰণ কৰা হৈছে: 2009-07-09. ↑ "Forbes Profile: Indra Nooyi". http://people.forbes.com/profile/indra-k-nooyi/62917। আহৰণ কৰা হৈছে: 2007-12-09. ↑ Brady, Diane (2007-06-11). "Indra Nooyi: Keeping Cool In Hot Water". BusinessWeek. http://www.businessweek.com/magazine/content/07_24/b4038067.htm। আহৰণ কৰা হৈছে: 2009-07-10. ↑ « The World's 100 Most Powerful Women », peoplestar.co.uk, Retrieved on 2010-10-11. ↑ "The 100 Most Powerful Women: #3". Forbes. 2008-08-27. http://www.forbes.com/lists/2008/11/biz_powerwomen08_Indra-K-Nooyi_1S5D.html। আহৰণ কৰা হৈছে: 2008-08-27. ↑ "50 Most Powerful Women 2006: #1". CNN. http://money.cnn.com/popups/2006/fortune/mostpowerfulwomen/1.html। আহৰণ কৰা হৈছে: 2009-09-22. ↑ Benner, Katie; Levenson, Eugenia; Arora, Rupali. "50 Most Powerful Women 2007: #1". CNN. http://money.cnn.com/galleries/2007/fortune/0709/gallery.women_mostpowerful.fortune/index.html। আহৰণ কৰা হৈছে: 2009-09-22. ↑ Shambora, Jessica; Kowitt, Beth (2008-10-16). "50 Most Powerful Women 2008: #1". CNN. http://money.cnn.com/galleries/2008/fortune/0809/gallery.women_mostpowerful.fortune/index.html। আহৰণ কৰা হৈছে: 2009-09-22. ↑ Shambora, Jessica; Kowitt, Beth (2009-09-15). "50 Most Powerful Women 2009: #1". CNN. http://money.cnn.com/galleries/2009/fortune/0909/gallery.most_powerful_women.fortune/index.html। আহৰণ কৰা হৈছে: 2009-09-22. ↑ "America's Best Leaders: Indra Nooyi, PepsiCo CEO". http://www.usnews.com/articles/news/best-leaders/2008/11/19/americas-best-leaders-indra-nooyi-pepsico-ceo.html। আহৰণ কৰা হৈছে: 2008-11-20. ↑ "Academy Announces 2008 Class of Fellows". American Academy of Arts & Sciences. 2008-04-28. http://www.amacad.org/news/new2008.aspx। আহৰণ কৰা হৈছে: 2009-07-09. ↑ "PepsiCo’s Indra K. Nooyi Elected Chairman of U.S.-India Business Council" (PDF) (Press release). U.S. Chamber of Commerce. 2009-01-23. http://www.uschamber.com/NR/rdonlyres/exbnjy4mawims7mptd6isnhtvkqorskmwlupfr72a5u6sfs52z2ow6hh6fzrimvldilpygy5be2eefgrnnq6yyglhyh/2008.01.23PepsiCosIndraNooyiElectedasUSIBCsChairman.pdf। আহৰণ কৰা হৈছে: 2009-07-09. ↑ "USIBC Leads U.S. Commercial Nuclear Executives to Help Implement Historic Nuclear Deal" (Press release). U.S. Chamber of Commerce. 2009-01-16. http://www.uschamber.com/NR/rdonlyres/eekwkh6jdasrtonek2fpjfev7x2dt35lwlkoxjxkq2skspnd6omydisjceahnorox2jsboessxzjegrhxmrp4b5rrye/PressRelease2009.01.16USIBCLeadsU.S.CommercialNuclearExecutivestoHelpImplementHistoricNuclearDeal.pd.pdf। আহৰণ কৰা হৈছে: 2009-07-09. ↑ "The World's 100 Most Powerful Women". Forbes. http://www.forbes.com/wealth/power-women. ↑ Shambora, Jessica; Kowitt, Beth (2010-09-30). "50 Most Powerful Women". CNN. http://money.cnn.com/galleries/2010/fortune/1009/gallery.most_powerful_women.fortune/index.html. ↑ "Indra Nooyi second most powerful woman in US business". Indiavision news. 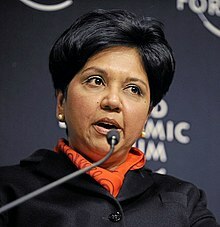 Oct 1, 2011. http://www.indiavision.com/news/article/business/234484/indra-nooyi-second-most-powerful-woman-in-us-business/. ↑ "NCUniversity 2013: Citations for Medalists". http://news.ncsu.edu/releases/freelon-to-speak-at-nc-state-commencement/. ↑ "University of Warwick 2011: Citations for Medalists". http://www2.warwick.ac.uk/newsandevents/pressreleases/olympics_weirdstones_pepsi/. ↑ "Miami University 2011: Citations for Medalists". http://www.miamialum.org/s/916/internalNL.aspx?sid=916&gid=1&pgid=252&cid=6868&ecid=6868&ciid=25489&crid=0. ↑ "Pennsylvania State 2010: Citations for Medalists". http://live.psu.edu/story/45336. ↑ "Duke University Commencement 2009: Citations for Medalists". http://today.duke.edu/2009/05/commencement.html. ↑ "Barnard College Commencement 2009: Citations for Medalists". http://www.barnard.edu/commencement/2009/citations.html. ↑ [|Tikku, Aloke] (2007-02-23). "Khushwant, Karnik, Nooyi, Remo, Mittal on Padma list". Hindustan Times. http://www.hindustantimes.com/StoryPage/StoryPage.aspx?id=14130333-163e-4218-ba2f-4e1cb2277f39। আহৰণ কৰা হৈছে: 2009-07-09. ↑ "Babson College Commencement 2004: Citations for Medalists". http://www3.babson.edu/archives/awards/honorary_degrees.cfm. ↑ "PepsiCo president Indra Nooyi elected to Yale Corporation". Yale Bulletin & Calendar. 30 August 2002. http://www.yale.edu/opa/arc-ybc/v31.n1/story3.html। আহৰণ কৰা হৈছে: 6 July 2009. ↑ "Board of Directors". Catalyst. http://www.catalyst.org/page/89/catalyst-boards। আহৰণ কৰা হৈছে: 2009-07-09. ↑ Credeur, Mary Jane (15 August 2006). "Pepsi's Indra Nooyi Led Non-Soda Growth; Women CEO Exemplar". Bloomberg, L.P.. http://www.bloomberg.com/apps/news?pid=newsarchive&sid=aVxff5ovmqYk। আহৰণ কৰা হৈছে: 17 August 2011. ↑ Seabrook, John. "Snacks for a Fat Planet". http://www.newyorker.com/reporting/2011/05/16/110516fa_fact_seabrook?currentPage=all। আহৰণ কৰা হৈছে: May 28, 2013.